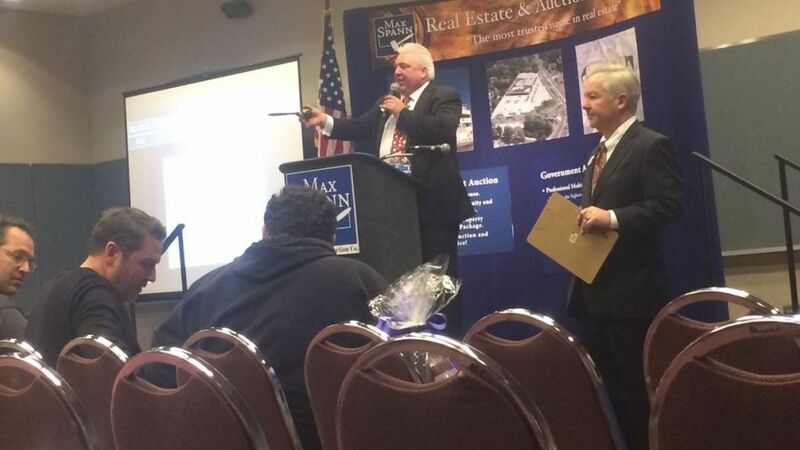 Joseph Bodnar, auctioneer for Max Spann Real Estate and Auction Co., auctions off properties during a land sale Tuesday at the Atlantic City Convention Center. More than $1.6 million in surplus property was sold. ATLANTIC CITY — The opening of the Hard Rock Hotel & Casino and anticipated Stockton Gateway Project next year have increased both interest in and the value of the city’s real estate. Those marquee projects are helping drive a change in perception regarding the resort, and that’s driving up real estate prices, said Max M. Spann Jr., president and chief executive officer for the company auctioning city properties. During a land auction Tuesday at Atlantic City Convention Center, the Max Spann Real Estate and Auction Co. sold more than $1.6 million worth of surplus city-owned property. Many of the properties, mostly open lots, were auctioned in bundles. After years of casino closings, the city appears to be heading for a rebirth in 2018 — and land buyers have noticed, said Flamur Rama, founder and CEO of AAR Renovations, who was at the auction looking for properties. In summer 2018, Hard Rock is expected to open its casino hotel. The company plans to spend $500 million renovating the property into its universally recognizable brand. The project is expected to generate more than 1,000 construction jobs and 3,000 permanent jobs, according to the company. A couple of months after Hard Rock opens, Stockton University plans to open its 675,000-square-foot, $220 million Gateway Project — the new headquarters for South Jersey Gas and a campus for the university that includes an academic building, housing for more than 500 students and a parking garage. Next fall, The Beach at South Inlet, a residential project on a grassy four-acre lot bound by Atlantic, Pacific, New Jersey and Connecticut avenues, will bring a much-needed boost to a struggling area. Tuesday’s auction was the third the company has done for the city, Spann said.